UPDATED: Sat., Sept. 1, 2018, 12:20 a.m.
LARAMIE – In all likelihood, a football game played between Wyoming and Washington State in 2017 would’ve been more appealing from a promotional standpoint, would’ve come with a different level of fanfare and, no doubt, would’ve brought a larger crowd of NFL scouts to the press box at War Memorial Stadium. So Saturday’s game between the Cowboys (1-0) and Cougars (0-0) could be decidedly more defensive than it may have been 365 days ago, presuming each of the quarterbacks still have some kinks to iron out and some growing pains to work through. Wyoming’s FBS-topping altitude of 7,220 feet may be another obstacle – really for either team, considering the Cowboys’ Vander Waal is also making his first start in Laramie – and the violent headwinds that rip through War Memorial Stadium certainly don’t make things any easier for an offense that’s prone to air it out 55 times per game. On the flip side, maybe this is the ideal setting for Tracy Claeys to roll out the retooled WSU defense. Six-hundred twelve. That’s how many days have elapsed since Claeys last appeared on the sideline of a college football game. Painful as it is, Cougar fans remember his last cameo well. Claeys, then the head coach at Minnesota, orchestrated a 17-12 win over the Cougars in the 2016 Holiday Bowl, handcuffing the Air Raid offense, allowing just one touchdown and 39 yards on the ground. That attention to detail in defending the run could be crucial for the Cougars in Laramie. Vander Waal’s arm wasn’t called on much in Wyoming’ season opener, primarily because three Cowboy tailbacks were able to run wild against New Mexico State, accumulating more than 300 yards on 53 carries, for three touchdowns. Nico Evans may not have been a focal point of WSU’s film study before the NMSU game, but he certainly grabbed the Cougars’ attention after rushing for 190 yards on 23 carries – an average of 7.9 yards per carry – and two touchdowns, all career-highs for someone who’d only recorded 36 rushing attempts his first three seasons in Laramie. The Cougars are depending on one of those seniors, too. 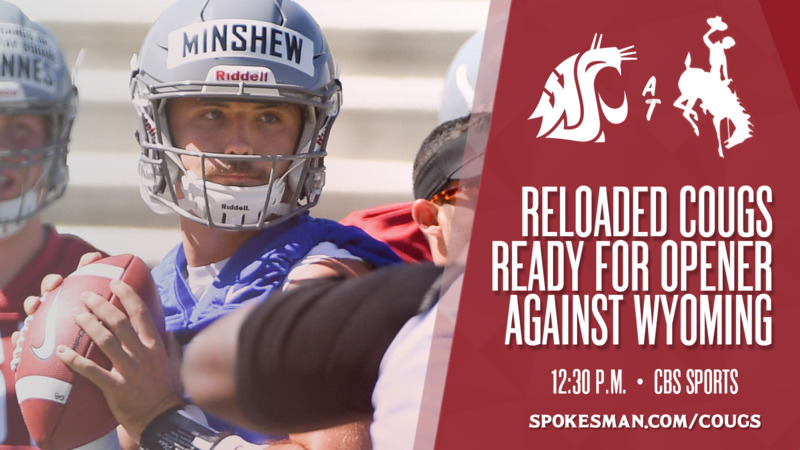 Minshew, the East Carolina graduate transfer in line to replace Falk, inherits an offense that replaces six starters – his position included – and faces a Wyoming defensive unit that returns all but three from last season. Wyoming’s defense is spearheaded by preseason Mountain West Defensive Player of the Year Andrew Wingard, a physical senior safety who entered the season with 367 career tackles, putting him 100 shy of the program record. The Cougars’ embattled defensive line may have run into some more adversity. Misiona Aiolupotea-Pei, a junior college transfer who became WSU’s backup nose tackle after Pono Lolohea’s defection, is unlikely to play in the season opener. Aiolupotea-Pei last attended Riverside City College in California. The former rugby player is originally from Gold Coast, Australia, and went to high school in Wellington, New Zealand. Published: Aug. 31, 2018, 7:56 p.m. Updated: Sept. 1, 2018, 12:20 a.m.